We last checked into our Summer Youth Leaders @ Pearl Bailey Branch in Newport News here. 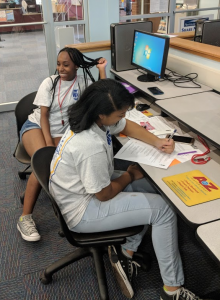 Along with all of the training they get as part of the Wickham Avenue Alliance Youth Leadership Program and with their work helping us in our library, these teens also learn valuable skills related to joining the workforce. Using the Career Investigations Curriculum, and thanks to the generosity of the Dollar General Literacy Foundation and YALSA, we designed an interactive day of activities to teach our Summer Youth Leaders (14-15 year olds) where to look to apply for jobs online, all of the rules regarding youth employment in the state of Virginia, help them to design a resume, and how to prepare for and participate in a job interview. 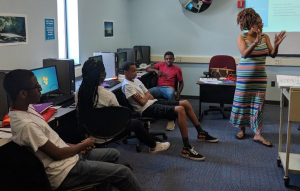 Career Readiness Training Day was a hit with our Summer Youth Leaders, thanks to the teaching and patience of Ms. Andreia Nelson of the C. Waldo Scott Center, a partner in the Wickham Avenue Alliance. They first took a short pre-test to see what they knew of workplace etiquette, then they worked together to correct mistakes in a sample resume. Everyone then took a Kahoot quiz (online or on their phones) on state labor laws or regulations, with a Dollar General gift card prize for the winner! 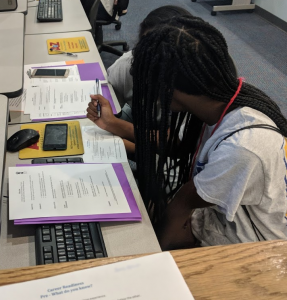 Following that contest, each of the youth leaders were given a free flash drive and worked together to create their own resume, geared toward a job that they might like to have. Following that, we provided them with materials and showed videos that demonstrated what to do (and not to do) in a job interview. All of the Youth Leaders had interesting questions about the process of getting a job, and asked both of us facilitators what we looked for when we interviewed a job candidate. The quick answer: someone who shows up on time, comes prepared, demonstrates that they care about fulfilling a customer’s needs and answering their questions, and isn’t afraid to ask questions of their own if they don’t get it. At first, they were confused by our “post-interview professional handshake” contest, but they all succeeded in the end. 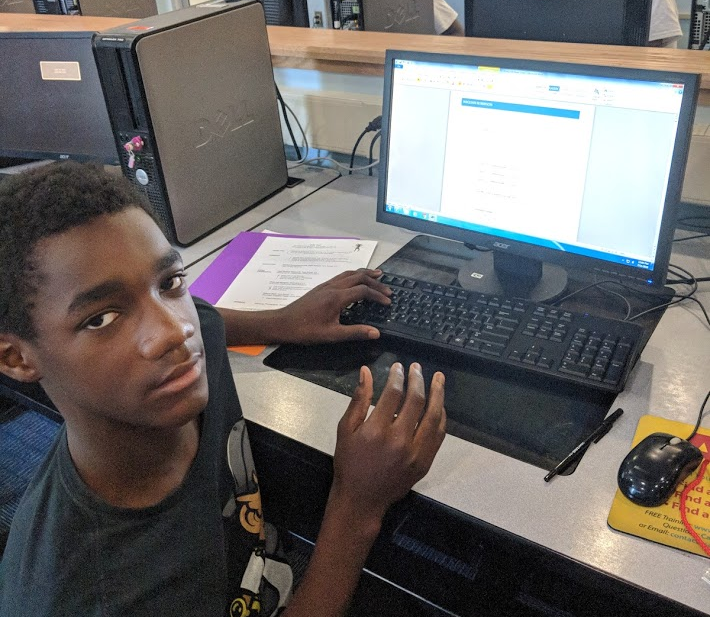 At the conclusion of Career Readiness Training day, the Youth Leaders did a post-test to see what they had learned, and then they all voted as a group on where they wished to go for their surprise end-of-summer party–Water Country, USA. If anyone has questions or is interested in the materials used for Career Readiness Training Day, please feel free to contact Zach Elder (zelder@nnva.gov). For college and career readiness resources, check out the YALSA Wiki. Na’quan picks a template for his resume. Alysse and Sari concentrating on the career readiness post-tests. WAA Youth Leaders listening to Ms. Nelson explain how to make a great first impression during an interview. Sari and Alysse may have had too much fun correcting the sample resume. Zachary Elder is the Manager of the Pearl Bailey Branch Library and the Newport News Public Library. Tagged DGLF, dollar general literacy foundation, teen summer intern program.